Discussion in 'Holden Commodore How-To's' started by Lumps of cheese, Aug 29, 2008. Should it be ok to drive till we can get it reset? 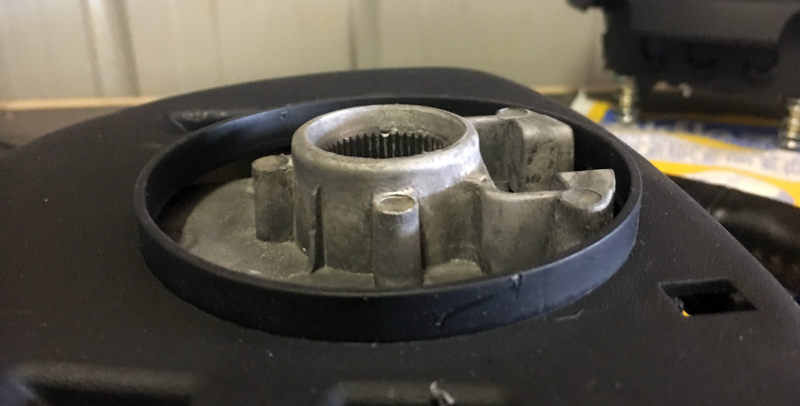 Its a good idea when removing the steering wheel to only back the the wheel nut off a few turns. 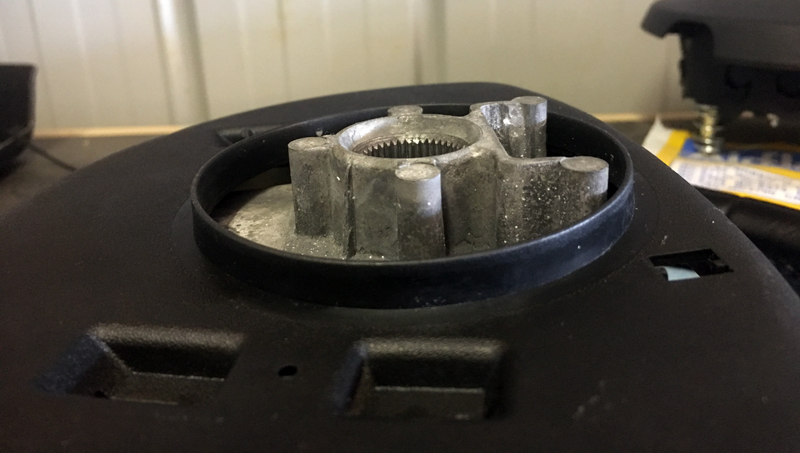 This allows you to jiggle and pull the wheel to release it from the splines without it flying off and damaging other components. I know this has been covered putting a VY wheel into a VZ, but does this still work putting a VZ wheel into a VY, if so what other mods need to be done? hey mate, just wondering where/how you got the blue and black leather on the hand beak and gear selector? looking for ages and cant find anything about them! A huge THANK YOU to 'Lumps of Cheese' for posting the original explanation. Excellent job! After disassembling my steering wheel, I was astounded at the exceptionally poor design used by Holden in constructing these steering wheel controls. Engineering a tiny tongue of plastic to form the hinge of these control buttons is clearly designed to last only as long as the car's warranty. The duty cycle for such a design would have to be in the hundreds (of presses) not thousands that would be endured during the typical life expectancy of the car. For those more experienced with Holden (I'm not), maybe this is indicative/expected of Holden? I shudder to think what else they've hidden away - designed to break without warning. By way of Thank You to Lumps of Cheese and others generously contributing to this site, I'd like to offer a small contribution of my learnings in this exercise. Perhaps it may benefit others. I had gone ahead and purchased replacement buttons from a wrecker but on discovering the poor engineering of the button hinges, I figured that even the replaced (used) set will likely be someway through its duty cycle and likely to break in the next year or two. So I set to fixing the original (broken) buttons from my wheel. Enter, my (very modest) leather-working skills .... read beginner. I carefully removed the button assembly from the base of each set of buttons. Easy to do with a small flathead under the retaining lip on the back fascia. This allows all 3 buttons (as one unit) to come clear of the button assembly which houses the circuit board - revealing the underside of the buttons. From here, I wiped clean the buttons inside and out, then hand-sanded both the inside and outside of the hinged area. This abraids the smooth plastic surface to provide a 'key' for gluing - that will hold. Once keyed and again cleaned, I used a sharp knife to cut a new hinge to place on either side of each set - that's 4 strips. I used black roo leather (0.88mm thickness) which is by far the thinnest and strongest leather. Roo scraps on eBay are perfect. For the inside-hinge leather, I crafted its shape to nicely fit into each button recess (20mm button width+5mm gap between buttons - repeat). All one piece of roo leather across the underside of all buttons and across the pathetic original Holden plastic hinge. The outside strip of leather is much easier - with no individual crafting needed for each button. So with inside and outside roo leather hinges carved for both button sets (4 in total), I then used a super-strong contact adhesive to "paint" all 8 surface areas - 4 leather faces and 4 button faces. Let them dry to tacky then put in place using small needle-nose pliers and a steady hand! Gently press all surfaces firmly together and allow to dry (12-24hrs). At this point, you've very effectively braced the crappy plastic hinge (perhaps broken) with some super-strong roo leather. The extra thickness from the roo leather is easily accommodated when reassembling the buttons into the button bases and then into the wheel itself. The roo leather will now outlast the vehicle by around 1,000 years! Never again will you need to replace these buttons. It's worth noting at this point that the hinge itself does not provide that tactile springback experienced when releasing the button from being pressed. The hinge is merely a pivot point. The springback comes from the inner-button (on the circuit board) that is being depressed by the outer button - the one you touch. Whatsmore, the travel of the button (when pressed and returning) is guided by retaining clips and channels in the button base. So this solution makes for a permanent, robust and transparent fix to what is essentially a very poorly designed switch. Like above, I hand-sanded the spokes clear of shiny surfaces to create a key. In this instance, I used black cow leather (1.2mm) to cover the spokes (but you could use any leather providing its thin) - again using the super-strong contact adhesive. Now these came up a real treat! They look fantastic done in black leather. Again, the extra thickness brought by the 1.2mm leather trim fits comfortably back into position on the wheel. No issues there. So now I have a "bullet-proof" steering wheel where the buttons will never break again and the spokes covered in robust leather that will never show that terrible paint-wear we all dread. Hey mate. You have picture of your handy work on the steering wheel?? Silly me reinstalled the buttons without taking shots while disassembled but I can take some shots installed on the wheel if that helps? I do have shots of the leather-lined spokes though. I've attached them for you. I have the wreckers replacement buttons (that I never used) still here. So if you're after a HOW TO on what I did there, I could prolly take some shots of the buttons and make notes on those shots as to what I did. Would that help? PS: Ignore the dust on the bottom left spoke. Should have cleaned that off and will finish it with pure Carnuba wax to seal it, give it a shine and extra durability from hand grease/sweat etc. Here's some pic's with annotations of the roo leather I added to either side of the buttons to form a long-term hinge. Do you think people would appreciate me offering the button repairs and/or leather-lined spokes as a service? Just that I notice buttons can no longer be bought new and used buttons will always be well into their life span. Flexing that plastic hinge on the buttons will fatigue the joint and eventually crack. It seems silly to me to pay $100+ for a used set of buttons that have the same design fault. Wouldn't it be smarter to pay (say $50) and get your own buttons repaired to better than new using my roo-leather approach (for buttons) and cow hide for lining the spokes? Maybe I'm being over-helpful here - in which case tell me "I'm dreamin'!". It just seems a bit of a gouge to me to have to pay $100+ for used parts that have the same issue. An update - just to test the waters, I put a set of genuine leather trimmed spokes on eBay. They sold in under 24hrs! The buyer was delighted. They look very smart and a good long-term resolution to those pathetic painted spokes. I'll throw a new thread up on these leather-lined spokes and the audio button-fix with roo leather - to see if anyone wants same. Doesn't matter if no-one is interested - but worth offering. 2. Custom laptop case for a lappie with a removable screen. 3. Climbers knife pouch with a karabina securing point. 4. Custom-designed and built A5 compendium with cards holders (LHS), pockets behind, twin gusseted pouches (RHS), pouch behind, pen holder, key ringclip, heavy-duty hand loop, zippered for closure and edge-trimmed with double-looped roo leather. Straight fit- no mods required. Its only the VY Steering Wheel that needs modding to fit VZ. Great thread, just need to go and buy a new set of radio control buttons and a new set of the steering wheel spokes as the paint is wearing off mine. I have one question though, is there a 'master spline' on the steering wheel so that it goes back on in the exact same place? Easiest ways to realign steering wheel back to where it was, scribe/scratch a small line from wheel onto steering column shaft or just a thin line from a marker pen will do. Best set of pics I've seen for VY horn pad removal. The silver spring clips were obviously designed by Bastards Inc. I had to try many different tools to poke, prod and pry until these let go of the securing pins. I've had audio button issues for a long while and was not paying $65 for second hand button assemblies of unknown serviceability. I sourced new (higher spec'd) "tactile" switches from my local electronics supplier and replaced the failed switches. Fully functional audio controls for $5.70 and a couple of hours labour. Cheers. Excellent quality pics. I had a broken "hinge" on my volume up button, whilst replacing the switches with better quality ones I repaired the broken switch with some five minute Araldite and two thin pieces of cable tie trimmed to straddle across the old hinge sections, this worked great and is stronger than the original and has similar "feel" also. The PCB's inside these audio controls appear to be made by VDO, unsure who designed and made the plastic mouldings but they leave something to be desired re quality and durability. IMHO VDO chose switches with a good feel but totally under-rated specs for heat. You can pull the switch tops off and with some care clean the circular shaped contact by lightly rubbing it over some well -worn wet & dry paper. This should bring back down the switch contacts high resistance allowing them to operate properly again. I thought I would post up these photos as a few asked and there was no clear answer. From what I read in this thread only the top spines need to be filed down when putting a VY steering wheel on a VZ. But I went the whole hog and made all five spines on the new VY steering wheel the same as the old VZ one. Good work Gould, just bought a 'VY-VZ' wheel without checking they were different, got lucky. Nice work also for Mr Cheese. Not sure on the leather-trimmed spokes. It brings the wheel back to looking like the rubber Executive wheel rather than an upgrade. Too much of a good thing there, but good idea re: button fix, repairing them using a solid-setting glue or bridge is just setting up the next failure sooner.